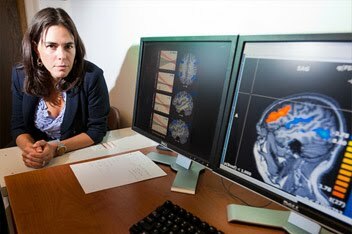 Beilock’s research is the basis of her new book, Choke: What the Secrets of the Brain Reveal About Getting it Right When You Have To, published Sept. 21 by Simon and Schuster, Free Press. Some of the most spectacular and memorable moments of choking occur in sports when the whole world is watching. Many remember golfer Greg Norman’s choke at the 1996 U.S. Masters. Norman had played brilliantly for the first three days of the tournament, taking a huge lead. But on the final day, his performance took a dive, and he ended the Masters five shots out of first place. Choking in such cases happens when the polished programs executed by the brains of extremely accomplished athletes go awry. In Choke, Beilock recounts famous examples of these malfunctions in the context of brain science to tell the story of why people choke and what can be done to alleviate it. Thinking too much about what you are doing, because you are worried about losing the lead (as in Norman’s case) or worrying about failing in general, can lead to “paralysis by analysis.” In a nutshell, paralysis by analysis occurs when people try to control every aspect of what they are doing in an attempt to ensure success. Unfortunately, this increased control can backfire, disrupting what was once a fluid, flawless performance. The brain also can work to sabotage performance in ways other than paralysis by analysis. For instance, pressure-filled situations can deplete a part of the brain’s processing power known as working memory, which is critical to many everyday activities. Even when a student is not a member of a stereotyped group, tests can be challenging for the brightest people, who can clutch if anxiety taps out their mental resources. In that instance, relaxation techniques can help.